I agree, I doubt the traction magnet will help any running a stocker at 14v. 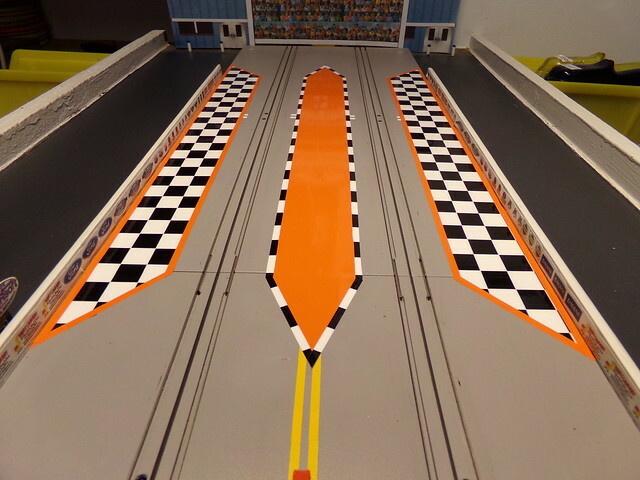 In testing earlier today at 14v, many of my faster Dash cars could not stay in the slot when they had descent tires. Had to add traction magnets. Bill traction magnets are not allowed in Tjet Stock.....but wheelie bars are. Don't know how I missed that. Thanks for setting me straight. Wouldn't you know it, my best cars were AW Ultra Gs. Are they OK with the traction magnets popped out? some changes to the stock cars as they did not like the lower voltage, getting close to getting it right now. The gassers did not need much, just a little tuning. Bill all chassis are allowed. Just remove the traction magnets. tire diameters helped and I ended up with 2 completely different sizes for the 2 stockers, surely confused me??? Dave, my cars don't like the low voltage either. It's like taking away their race fuel and making them run on pump gas. Removing the traction magnet won't be a big issue, as most of them are just mounted temporarily, with 2 sided tape. Another possibility could be to drop in a mean green and move up to the SS class. Speaking of that I did try an Aurora gear plate with a mean green in a Dash chassis. It acted like the comm was not making good electrical contact with the brushes. Dash and Aurora parts are supposed to be interchangeable. Are weights permitted in the stock class? ........... Are weights permitted in the stock class? I don't know for sure but ... the way I read the rules was that they had to meet a minimum weight (21g) and that no maximum weight was mentioned. From that I took it to mean one could add weight to one's desire. It'll be good to get some clarification. I had to add weight to my tjet stock, just to meet minimum and it ran .3 to .4 better than without it. Yes adding weight is permitted. As Gale said, there is a 21g minimum in the body rules but no maximum. "Speaking of that I did try an Aurora gear plate with a mean green in a Dash chassis. It acted like the comm was not making good electrical contact with the brushes. Dash and Aurora parts are supposed to be interchangeable." Model Motoring still holds trademark rights to chassis. there has to be a 20% difference in design to avoid violation. check out the diameter of the armature shaft on a DASH. smaller than an Aurora t-jet. so there are other parameters within the DASH design to separate it from the AW and Model Motoring chassis. also, another reason AW included the traction magnet. you will also notice that magnet dimensions are slightly different amongst the brands. I also noticed that the top plates are different also, the cluster gear on an AW will not mesh properly with a T jet. 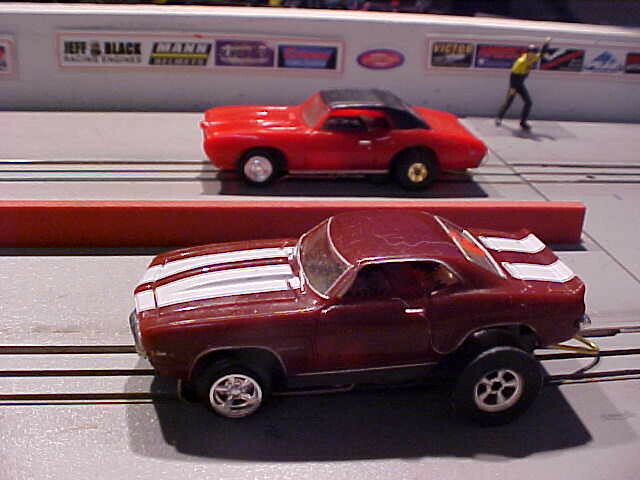 Here are the stockers a Camaro that looks like one of my old drag cars, (thanks to ECBill), and a Pontiac GTO. any of the scale people that get in its way!!! Finished the Start line graphics. I'm using some adhesive film that is used for model airplanes and rockets. Stumbled onto it at a local hobby shop. Works very well for this application. 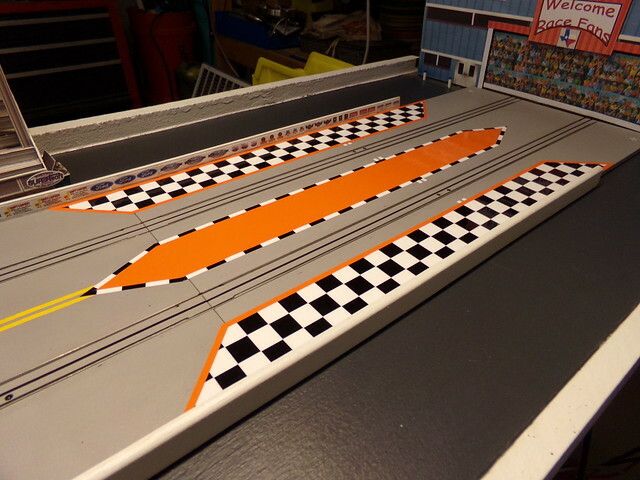 I am happy with the way it turned out......adds a little "pop" to the track. Starting to get pumped for the race!! Looks good Jeff, I will be working on my track deco soon. 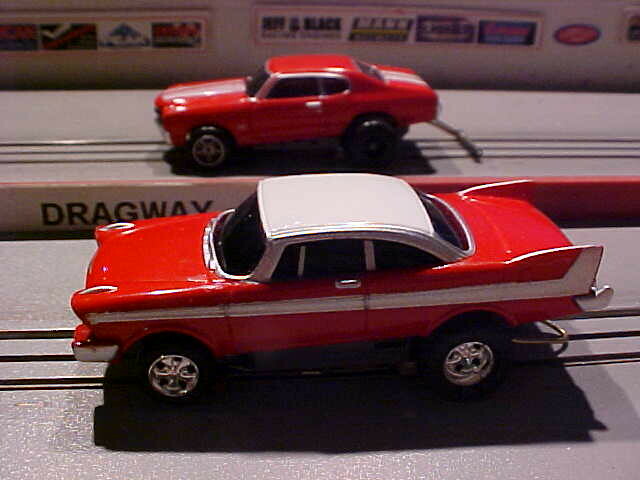 I bought some red like that, did you adhere it to the track or just lay it down? Thanks guys for the good word. Dave it is adhered to the track. I was going to use blue pinstriping for the border, but decided to use strips I cut from the orange and the checkerboard. Look forward to seeing your track.